Consumers rely on calls for research and transacting. We broke down the purchase process into its component phases – Inspiration, Research, Purchase, and Post Purchase Experience – to see when consumers are most likely to call a business. We found that calling is most important during the research and purchase phases, where 52% and 61% of mobile searchers respectively say it’s important to have the ability to call. This means that a large number of calls happen when someone is ready to buy or helps a consumer move closer in purchase consideration. 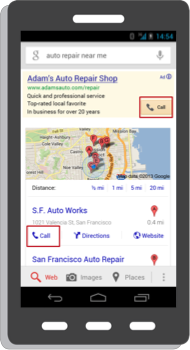 Calls originating from the search results page are valuable for businesses.